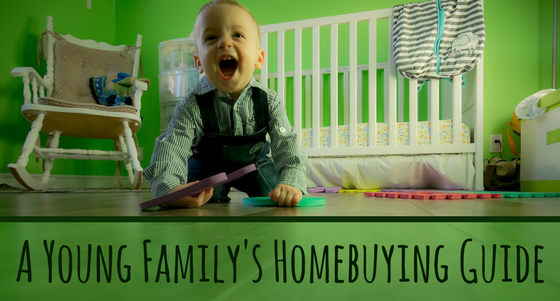 Being a first-time homebuyer and starting a family at the same time isn’t easy. But exactly the fact that it isn’t easy gives you the perfect opportunity to step in as an expert, and give a helping hand in their time of need. Below I’ve attached a simple guide for young homebuyers that can help your clients find their way around their first big, home investment. Providing freebies like this is a great way to build your reputation, expand your social-media presence, and fill your sales funnel. Feel free to use, comment and give me your feedback, I’d be happy to hear it. You are about to start a family, or maybe you already have, and for the first time in your life you’re finding yourself looking at properties, trying to put together an image of a home for your family. It’s not easy, especially if you’ve read all those articles about millennials being between a rock and a hard place when it comes to finding their way to the housing market. But no worries, nothing is as black and white as the oracular articles on the internet make it seem. There are some initial steps that you need to make, but once you get that under your belt, you’ll be ready to take on the challenge of owning your first home! You’ve probably heard this one before, but before you tell me you’ve thought this through, let’s just make sure you really have looked from all the possible angles. What your loan officer thinks and what your reality is are two different things. If now you can afford a mortgage but you’re expecting a baby, you need to realize the future costs that will add to the financial strain on your family. College funds, preschool fees, even diapers and formula are all quite heavy items in the family budget. On a different note, do you own a car or are you planning on buying one? You will definitely need one, and the accompanying payments have to be reckoned with, too. Keep in mind that there are other costs of home-ownership than “just” the mortgage. Once you buy it, you are responsible for all the repairs and replacements, but also property taxes, homeowner’s insurance, utility bills and more. Don’t let all this scare you off, that’s absolutely not the point. Just make sure you’re taking all the applicable facts into consideration and be ready to tighten your belts if needed. First of all, buying a house won’t go through without a mortgage, and the majority of mortgages won’t go through without a down payment. There are other factors, too. But these two play the key role. When it comes to down payments, most of the loans won’t cover 100% of the house’s cost. You’ll need to bring at least some contribution from your own pocket, to prove that you’ve got at least the basic resources. Have you checked with your loan officer on the options of the various low down payment programs such as USDA, VA or conforming mortgage? They have strict rules, but they’re definitely worth checking out if they can save you some trouble, and help you get a loan in the first place. Before you start shopping for a home, you should get pre-qualified by your mortgage lender of choice. A pre-qualification isn’t a guarantee of a loan, but it gives you a rough idea of what the bank thinks you’ll be able to afford. Having this information in hand will help you have realistic expectations (see below) before you start shopping. After the pre-qualification, you should seek pre-approval, or, better, TBD approval. Pre-Approval also isn’t a guarantee of a loan; however, it includes a detailed analysis of your credit score and the documentation you’ve provided, and usually provides a pre-approval letter that you can use when making an offer on a home. Getting pre-approval is good both for you and the seller. But best of all, try and get TBD-approval. TBD approval is less well known, and less wide-spread than pre-approval, but if it’s available, you should get it. The difference between this and pre-approval is that you end up with a hard approval for your maximum monthly mortgage payment, which enables you to do a very quick closing. Particularly in competitive markets, the ability to close quickly can be the difference between a seller accepting your offer, or that from someone else. Almost every single one of the clients I’ve ever spoke with had a dream house in their head that they just couldn’t let go. It’s a good thing to follow your dreams, but first you’ve got some budgeting and benchmarking to do. What is more important: getting your dream house NOW and get into a debt you absolutely cannot handle, or get your family a good place to live on manageable expenses with an outlook for moving up a few years from now? Think about all the possible scenarios. What if you or your spouse lose a job? What if you need to move for work? What if there’s a medical emergency? Will you still have a safety cushion for all these instances? A starter home is called a starter home for a good reason, they give you the chance to try it out at a reasonable cost, without draining your family budget. Plus, they have many other perks. Many families decide where to live based on the location; the community circumstances. Schools and nurseries, playgrounds, parks, grocery stores and shopping malls, entertainment options and hospitals are all parameters you should consider when looking at properties. Is the neighborhood safe? Are there other young families to socialize with? How about the commute to schools, soccer playing-grounds, dance lessons, and also to your job? Some of these things might not matter right now, but they will matter in a couple of years. Just imagine that you don’t notice the missing sidewalks on your block, but in a couple of years your kid will need to walk to the bus stop to go to school, and suddenly it becomes a serious safety issue. Always try to plan ahead, not just for a stroller, but for an actual pre-schooler or first-grader. This guide might come off as somewhat resolute and overly cautious, but remember, it’s your family’s comfort for the next bunch of years we’re talking about now. You don’t want to miss a thing — in all the meanings of the expression.